The Anti-Alias Multichannel Module (AAMM) provides all-digital filtering that delivers data free of aliasing effects, with superior data quality to that provided by hardware anti-alias filters. 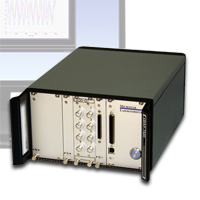 Most applications built on xDAP systems can dispense with hardware anti-alias filters entirely by sampling at a high enough rate to observe the entire signal bandwidth. When signal bandwidth is so high that sampling the full signal band is not possible, the AAMM still provides a significant advantage over a pure analog solution to anti-aliasing by allowing you to use a much lower order analog filter. In addition, by using only a small fraction of the analog filter pass band, you avoid the inherent signal corruption introduced by all analog anti-alias filters. With the AAMM you can select any application-side sampling rate you wish with resolution to tiny fractions of a picosecond. For example, you can set a sampling rate of 43234.5 samples a second or absolutely any other rate you may need for your application. Because the AAMM dynamically configures its filters to match the rate you select, it can let you use any rate at all. The AAMM filters are linear phase with with near zero signal attenuation through 80% of your output Nyquist rate giving your application near perfect reproduction of your original signals, while still giving you the anti-aliasing you need. The AAMM works with all xDAP systems. It is available as part of the DAPtools Standard software package.